Representations are subject to change, both historically, politically and socially – this analysis focuses on the changing representations of masculinity in film and how these representations are mediated, selected, constructed and encoded with preferred meanings for audiences. For the purposes of G325 Section B: Collective Media Identity, students will study two media. Representation defines the way a social group, e.g. masculinity is constructed for audiences while a collective media identity implies that homogenous groups all behave the same way and have common representations that are recognised and identified by audiences. To explore this notion of masculinity in film theoretical frameworks are of assistance e.g. Baudrillard and hyper realism as are ideas of hegemonic and more pluralistic representations. Key theory and the work of key theorists such as David Gauntlett and David Buckingham will allow for a more balanced analysis. Historical representations are subject to more hegemonic cultural stereotypes reflecting changes in society – Adorno suggests in this regard audiences are more subject to, or are more likely to be subject to passive consumption in terms of the act of recognition. Film has the habit of leaving strong mental images on the memory and as a result, neuronal connections are strengthened. 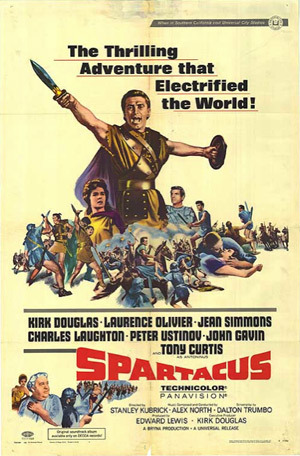 Kirk Douglas in Spartacus (1959) remains an iconic, brave, idealistic, strong and determined representation of masculinity – from slave to gladiator he leads his troops into battle against Crassus’s (Laurence Olivier) Roman legions. 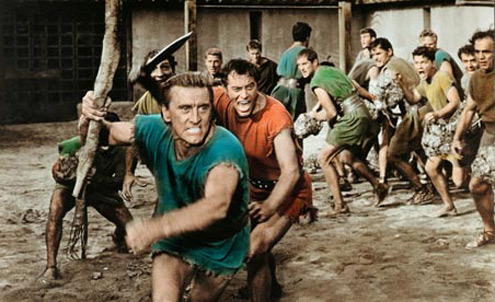 Physical strength determines gender as Kirk Douglas embarks upon another brutal, muscular performance as the heroic leader of the downtrodden. Douglas was himself ex Navy and used his secondary persona to secure hyper real masculine roles such as boxer Midge Kelly in Champion (1949) and Doc Holliday in the 1957 film Gunfight at the O.K. Corral.